Recap / Star Trek: The Next Generation S6E4 "Relics"
The Enterprise finds the USS Jenolan, a ship that was missing for 75 years, crashed on the surface of a Dyson Sphere. An away team of La Forge, Riker, and Worf beam over to the transport ship, which amazingly still has power. Although life support is working, the ship seems deserted. Just then, La Forge notices that the transporters on-board have been modified somehow and that there's still a pattern stored in them. The teleporter is activated, and who else materializes on the pad but Scotty himself! After Scott thanks La Forge for re-materializing him, he runs over to the transporter console and attempts to retrieve a second pattern, that of Ensign Matt Franklin, but unfortunately, one of the phase inducers has failed and the transporters cannot compensate  Franklin's pattern has degraded too much for him to be rematerialized. Riker offers his condolences and introduces La Forge and himself to Scott. When Riker explains that they came from the starship Enterprise, Scott reacts understandably, believing he was saved by a crew led by Jim Kirk, and asks how long he was in the pattern buffers. Worf interrupts the conversation and Riker introduces the security officer to Scott. Learning that there is a Klingon serving in Starfleet, Scott realizes that he has been in the buffer for an extremely long time. When asked why he used the transporters to place himself and Franklin in such a state, Scott explains that although only he and Franklin survived the crash, there were too few supplies to survive long enough to be rescued. After transporting back to the Enterprise, La Forge escorts Scott to sickbay while discussing some of the advances in technology over the past seventy-five years and the events leading to the Jenolan's crash. La Forge tells Scott that he is very impressed with his use of the transporter to survive, but Scott acts modestly, due to the fact that he lost his friend. In sickbay, Scott is diagnosed with only minor injuries. Captain Picard greets Scott in sickbay and is surprised that he was on board the Jenolan, as the engineer wasn't listed in the crew manifest. However, Scott explains that he was traveling aboard the Jenolan as a passenger to the Norpin colony on Norpin V to enjoy his retirement. When La Forge is ordered to study the Dyson sphere, Scott is eager to help, but Dr. Crusher advises him to rest. When Scott is escorted to his quarters by Ensign Kane, he is awestruck at the luxury that he is entitled to, compared with starships of his time period. Scott, with much enthusiasm, reminisces to Kane about his years in Starfleet, but Kane has little interest in Scott's nostalgia and returns to duty, leaving Scott alone, feeling much less enthusiastic and somewhat pensive about life in the 24th century. As La Forge and his team are working on their spectrographic analysis of the sphere, Scott interrupts, insisting on offering La Forge his assistance. La Forge skeptically accepts Scott's offer and the team begin their duties. Meanwhile, on the bridge, Data reports to Captain Picard that the sphere was built around a G-type star and that its interior surface provides an environment much like that of an M-Class planet, but there are no apparent signs of inhabitants. Picard orders for probes to be launched to speed up the scans of the sphere. Back in engineering, Scott finds further advances and changes in technology that in his era were dangerous. La Forge is quietly becoming irritated until Scott offers advice on how to deal with Starfleet captains. 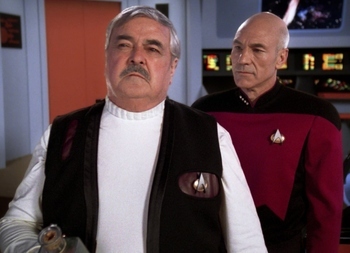 When La Forge finally voices his frustration and tells Scott that he is in the way, the older officer leaves engineering in a disgruntled state. Later, Scott arrives in Ten Forward and orders a drink of Scotch whisky. He is repulsed when he tastes the drink, realizing that it is not "real" Scotch. Data approaches and tells Scott about the use of synthehol instead of alcohol and offers him a "real" alcoholic drink of Aldebaran whiskey from Guinan's personal supply. The engineer's reaction to this drink is much more pleasant. "NCC one-seven-oh-one. No bloody A, B, C, or D."
The computer accepts his instructions and creates an authentic replica of the bridge of the ship he served on for the longest duration. Scott fondly remembers his time aboard his former ship, even drinking a toast to his absent comrades. He sits down at his old engineering station and gives a deep, dejected sigh just as Captain Picard walks in after coming off duty and excuses himself for interrupting. Scott perks up and welcomes him into the simulation, offering Picard a drink, which he happily accepts. Just as Scott is about to warn Picard of the drinks' strength, Picard downs a glassful, which he instantly recognizes as Aldebaran whiskey and tells Scott he gave it to Guinan. Picard recognizes the bridge as that of a Constitution-class starship, and explains that there's one in the fleet museum. Picard then recognizes the bridge as that of Scott's Enterprise. Scott then says he served on two, but this is the first one and the first ship he ever served on as chief engineer. Scott mentions that he served on eleven ships of varying class, but that Enterprise is the only one he misses or thinks about. Picard then recalls his first command on the USS Stargazer. Picard describes the Stargazer as overworked, underpowered and always on the verge of flying apart at the seams. Picard says that while his Enterprise is far superior, there are days when he'd give almost anything to command the Stargazer again. Scott compares their feelings as to the first time a man falls in love and that he never loves a woman quite the same way. They then share a toast to the original Enterprise and to the Stargazer, Scott calling them "old girlfriends we'll never meet again." Picard then asks Scott what he thinks of the Enterprise-D. Scotty calls her a beauty, but laments that when he was on his Enterprise, he could tell the speed of the ship by the feel of the deck plates. He then begins to feel gloomy and opines that he is in the way and obsolete in the 24th century. When Picard offers to let Scott peruse the updated technical manuals, Scotty refuses, saying that he can't start out again like a raw cadet. He says there is a time when a man knows it's time to quit and time to stop living in the past. He then shuts off the bridge simulation and leaves the holodeck feeling dejected but determined to start acting his age. Picard can only look on sadly as the legendary engineer exits, clearly feeling for the man. The following day, Picard asks La Forge about recovering the logs of the Jenolan, but the engineer says that all efforts so far have yielded very little as the ship's computer core was heavily damaged when it crashed. Picard suggests having Scott assist in trying to recover the ship's logs; La Forge agrees that Scott would be of great help as he knows the Jenolan's systems better than anybody on the Enterprise and says that he'll send Lt. Bartel with Scott over to the Jenolan. At this point, the captain asks that La Forge personally accompany Scott back to the Jenolan to recover the ship's logs, hoping to make Scott feel useful again. While Picard makes it clear that this is a request, not an order, La Forge understands the captain's motive and gladly accepts. In the morning, La Forge waits in the transporter room for Scott, who is late. He finally arrives and apologizes as they immediately enter the transporter, mentioning that he has a bit of a hangover. As La Forge and Scott transport over to the Jenolan, Data discovers a communications array in close proximity to the Enterprise's current location, and the crew set a course for it. As the Enterprise arrives at the array, the crew discovers a large hatch in the Dyson sphere, which they presume is a front door. As they open hailing frequencies, the hatch opens and a series of powerful tractor beams pull the Enterprise inside the sphere, easily overpowering it. Due to the fact that the resonance frequency of the tractor beams used to pull the Enterprise inside is incompatible with the starship's power systems, the relays for the warp and impulse drive overload and are rendered inoperable. The Enterprise has now lost primary and auxiliary systems and the ship is soon released from the tractor beams. However, because the Enterprise is still moving under the momentum of being towed in, it is heading directly for the star at the center of the sphere. Back on board the Jenolan, Scott is having trouble with recovering the ship's log, calling it "garbage." La Forge realizes that Scott is referring to both himself and the ship, and tries to console him by saying that the basics of technology haven't changed a great deal in seventy-five years, the transporters of the Jenolan are virtually identical to those of the Enterprise, subspace radio and sensors work on the same basic principles, and that impulse engine design has changed little in two centuries — long before Scott's time. La Forge adds that the Jenolan would probably still be in service had the vessel's structural damage not been so extensive. Scott is dismissive and retorts that nobody would want something as old as the Jenolan (and again hints at himself as well) but La Forge disagrees, saying that if the ship were in service, it could still run circles around the Enterprise at impulse speeds: "Just because something's old, doesn't mean you throw it away." Scott feels much more welcome and a bond begins to form between him and La Forge. However, the moment breaks as Scott moves back to the console he was working on. He asks La Forge to retrieve a dynamic mode converter from the Enterprise, a tool which may help to recover the Jenolan's log entries. La Forge suggests using something similar but his call to the Enterprise goes unanswered. Back on board the Enterprise, the ship is three minutes from being destroyed by the star. However, Commander Riker has managed to restore thirty percent power to the maneuvering thrusters, although they will still not be enough to save the ship from destruction. It is not until power is diverted from the auxiliary relay systems to the thrusters that the starship manages to achieve a stable orbit in the photosphere of the star. Picard demands to know why the Enterprise was towed in, and orders a scan of the sphere's interior for lifeforms. When La Forge and Scotty fail to locate the Enterprise, they realize that the starship must be inside the sphere. Although it seems impossible to repair the Jenolan's flight capability, the two engineers still try restoring power to the ship's engines. On board the Enterprise, Data reports to Picard that the star is highly unstable, expelling matter and severe bursts of radiation. This explains why the inhabitants of the sphere abandoned it. The android postulates that the Enterprise may have unintentionally triggered an automated series of tractor beams which would guide a starship inside the sphere — this would explain why the Enterprise was pulled inside without anyone occupying the sphere. When the star emits a solar flare, the Enterprise raises her shields accordingly, but the vessel's shields are only operating at 23%. To worsen matters, the solar flares are becoming larger and within three hours, the Enterprise's shields will no longer protect the starship. La Forge and Scott work on repairing the Jenolan's engines by jury-rigging the ship's supply of deuterium — La Forge initially insists that Scott's suggestion to send it through the auxiliary tank can't be done, but when he cites impulse engine specifications, Scott laughs, claims authorship of the regulation in question, and assures him that, while he knew the tank could handle the pressure, on paper a good engineer should be more cautious than in the field. Eventually, they are successful as power is restored. When Scott offers La Forge the command chair, La Forge is surprised as Scott is the senior officer. However, Scott tells La Forge that, while he holds the rank of captain, all he ever wanted to be was an engineer, and insists that La Forge take command of the Jenolan. La Forge finally accepts and Scott moves to the engineering console. Meanwhile, the Enterprise is heavily damaged by the star's solar flares, but Riker reports that partial impulse power has been restored. Picard asks Worf if the ship's phasers could be used to cut a hole through the shell of the sphere, allowing the Enterprise to escape, but the sphere is composed of carbon neutronium and phasers (or any other of the ship's weapons) would be completely ineffective. As the Jenolan slowly orbits the sphere, La Forge and Scott trace the impulse ion trail from the Enterprise to the hatch that the starship was pulled into. The ion trail's momentum distribution around the hatch suggests that the Enterprise's impulse engines were at full reverse and that the starship was dragged into the sphere unwillingly. La Forge and Scott realize that the hatches are access terminals (and not communications arrays), which are triggered by certain subspace frequencies, such as hailing frequencies. When the Jenolan opened hailing frequencies seventy-five years ago, the tractor beams locked on to the ship, severely damaging it and causing the vessel to crash on the surface of the sphere. Scott suggests positioning the Jenolan 500,000 kilometers, far enough away from the hatch, then opening hailing frequencies so that the hatch will open but the tractor beams will miss the ship. As the hatch would begin to close, the Jenolan would enter a gap between the doors and use the vessel's shields to hold the doors open for the Enterprise to exit the sphere. La Forge dismisses the idea as suicidal, but Scott pleads to him that the theory will work. Eventually, La Forge makes the decision to go ahead with Scott's plan. The engineers wedge the Jenolan between the doors, the shields hold and La Forge manages to open a communications channel to the Enterprise. The starship receives the hail and sets a course for the hatch. The Jenolan suffers heavy damage while the craft is wedged in the hatch and La Forge tells Picard that the Enterprise will have to destroy the ship to escape. When the Enterprise is in transporter range of the Jenolan, Picard gives the order to beam La Forge and Scott back on board (with the Jenolan's shields still raised) and fire photon torpedoes, destroying the Jenolan. The doors continue to close, but the Enterprise manages to exit the sphere. As La Forge and Scott walk off the transporter pad, Scott is cheerfully relieved to be returned to safety. Later, La Forge tells Scott about the Enterprise's encounter with a newborn life-form. It is obvious that a strong bond has formed between the two engineers. Scott was expecting La Forge to take him for a drink, but La Forge had different intentions. As they walk through the doors to Enterprise's shuttlebay, the senior staff is revealed, standing in front of a shuttlecraft, the Goddard. Picard offers Scott the craft on "an extended loan" basis in thanks for sacrificing the Jenolan to save the Enterprise. Scott says that he won't be going to the Norpin colony as he had first planned. The senior staff bids Scott farewell. Scott reveals his approval of the Enterprise-D and the starship's engineer. After shaking La Forge's hand, he departs the ship in his new shuttlecraft. And the Adventure Continues: The Enterprise crew loan Scotty one of their shuttles, allowing him to depart for more adventures in the 24th Century. Call-Back: Data's "it is green" line in Ten Forward is almost the same as a line Scotty uses in the TOS episode "By Any Other Name". Scotty also mentions events from the episodes "The Naked Time," "Wolf in the Fold," and "Elaan of Troyius". Geordi returns the favor by relating the events of "Galaxy's Child". A very minor one from "The Galileo Seven"Spock and Scott had a similar discussion about using a backup deuterium tank, which Scotty said was too delicate to take the pressure. Scotty is surprised that a Klingon (Worf) is serving in Starfleet. The last time we saw Scotty (at this point in the franchise) was Star Trek VI: The Undiscovered Country, when the Federation had just made peace with the Klingon Empire. Even better, the Klingon who acted as Kirk and McCoy's defender was actually Worf's grandfather. Cold Sleep, Cold Future: After a while, Scotty starts to feel he has no place in the 24th century. Conflict Ball: Even though he's on a tight schedule, it seems odd for a Nice Guy like Geordi to get angry to the point of snapping at him within ten minutes. Particularly at Montgomery Scott, who is to engineers what Kirk is to captains. But it pushes Scotty into Ten Forward and then the recreated bridge on the holodeck. Continuity Drift: Scotty believes Kirk sent the Enterprise to find him despite Star Trek: Generations later revealing that Scotty had been there when Kirk had been lost during the Enterprise-B's encounter with the Nexus. This is mostly due to the fact that the first draft of the Generations script wouldn't be written for another six months when the episode aired, and that Scotty was not even meant to be in Generations at all and was only brought in because Leonard Nimoy wasn't available. StarTrek.com attempted to handwave this by saying Scotty was disoriented while an Expanded Universe novel claimed that Scotty secretly hoped Kirk had made it out alive (which he did). Dyson Sphere: The setting for the episode. Whoever built it has long since abandoned it, as the star within is no longer stable enough for humanoids to survive within. Gadgeteer Genius: Both La Forge and Scotty for their respective eras. I Need a Freaking Drink: After an argument with Geordi, he goes to the bar to get drunk. He ends up drinking a special liquor that Picard provided Guinan. Like a Duck Takes to Water: Scotty tries to show that his engineering expertise is still useful in the 24th century. Red Shirt: The guy who went into transport suspension with Scotty. Died without appearing onscreen. Scotty is found with his injured arm wrapped in an improvised sling...a sling consisting of a strip of torn red fabric. Retirony: Not even Scotty was immune to it, since his transport to a retirement colony crashed on a Dyson Sphere. SciFi Writers Have No Sense Of Distance: When the Enterprise is pulled into the sphere, it's clear that the speed at which the ship is moving is very slow. Once inside, Data states that the ship is 90,000,000 kilometers from the star's chromosphere. The helmsman then states that the residual inertia from the tractor beam is causing them to drive towards the star. They treat this as being a dire emergency, but at the speed the ship is shown to be moving, it would take days, if not weeks, to actually reach the star. Sure enough, in what is clearly a matter of no more than an hour, the ship has come within 150,000 kilometers of the star and is at risk of being destroyed. Scotty Time: The Trope Namer himself discusses it with Geordi. Geordi: Yeah, well, I told the Captain I'd have this analysis done in an hour. Scotty: How long would it really take? Scotty: Oh, you didn't tell him how long it would really take, did you? Geordi: Well of course I did. Scotty: Oh, laddie, you have a lot to learn if you want people to think of you as a miracle worker! Later, when Geordi suggests they repair the Jenolan to look for the Enterprise, Scotty says it'll take a week just to get started. But, they don't have a week, so better get to work! Screw the Rules, I Make Them! : Scotty tells Geordi to shunt some pressure to a reserve tank. Geordi replies that the regulations state the tank can't withstand that much pressure. Scotty points out that he wrote the regulations in question, and "A good engineer is always a wee bit conservative, at least on paper." Starship Luxurious: Scotty is completely astonished by the size of the Enterprise-D. When he comments that even an admiral in his day wouldn't have quarters the size of the guest room he's given, the ensign attending him is confused and offers him something even bigger. The Enterprise-D's Junior Officers' Quarters set (usually Worf's quarters) was in fact Kirk's Quarters set from Star Trek: The Motion Picture and Star Trek II: The Wrath of Khan. Presumably an honoured guest would get bigger quarters than a junior officer, so Scotty's statement is correct. Technology Marches On: Happens In-Universe. Many engineering issues Scotty was proud to have handled during the 23rd century have been long resolved when he's found again. Though also inverted — Geordi mentions that some designs and theories aren't all that different than they were in Scotty's day, and had it not been for the structural damage the Jenolan would probably still be in Starfleet service. To Absent Friends: During the holodeck scene, Scotty raises a glass on the the original Enterprise bridge. Picard soon joins him, and the two offer a toast to their absent ships: the Enterprise and the Stargazer. Scotty: Ah, it's like the first time you fall in love. You never love a woman quite like that again. To the Enterprise and the Stargazer-old girlfriends we'll never meet again. Unwanted Assistance: Anytime Scotty tries to help Geordi in Engineering. Makes you feel bad for Scotty. The poor guy is really out of touch with the 24th century technology and he wants to do what he can to help the Enterprise. What Year Is This? : Naturally, Scotty wants to know how long he's been in transporter stasis. Scotty: I was drivin' starships while your great-grandfather was still in diapers! I think you'd be a little grateful for some help! I'll leave ya to work, Mr. La Forge. He also tells the bartender in Ten Forward that he's been drinking Scotch a hundred years before he was born. This bartender is not Guinan, so in this case it's true. You Are in Command Now: Scotty tells Geordi to take the Jenolan's conn. When Geordi points out that Scotty's the senior officer present, he brushes it aside saying that he may be a captain by rank but he's happier being just an engineer.